On reflection Fremantle is not a bad little city at all. I walked around town for nearly three hours today and was yet again delighted about the vibrant mood, with cafes and restaurants full and the markets packed with visitors and tourists. The small French wine bar in Essex Street whispered to come in and have a Cabernet, but I stayed strong and continued to the Fishing Boat Harbour, where Little Creatures was bouncing as well. White Rabbits were bouncing around in my head, but I resisted the temptation of indulging in black ale and took a few photos instead. I wandered around the city for a while to look at all sites proposed for new development. I needed to get my own eye in, and make up my own mind, as there is confusing and opposing information coming from those on council, with claims the new City of Fremantle’s advertisements are misleading and wrong. First I walked around the Woolstores site, both the Marilyn New owned and almost derelict one, but also the shopping centre. Would it bother me to see another 2-3 stories added to approve a beautiful 7-8 story building? No, it wouldn’t. But I would hate to see 10 or more stories on those sites. From there I circumnavigated the Queensgate site behind the Town Hall and again I would have no objections seeing a few more stories there, as long as the ugly building there would be replaced with something really good. I am tired of the us and them, the anti and pro development, the attacks on persons rather than on issues, that is happening right now. Disagree for all you want, but put out facts, not half truths or spin. If you serve the people of Fremantle crap, they will throw it back in your faces! Should my remarks disappoint people who believed I am on their side, let’s me set the record straight. I am on nobody’s side and will not be manipulated one way or the other. Serve up the facts is all I am interested in. But should anyone on council accept and approve unlimited height in the city centre, I will be on the side of everyone willing to help me prevent it! 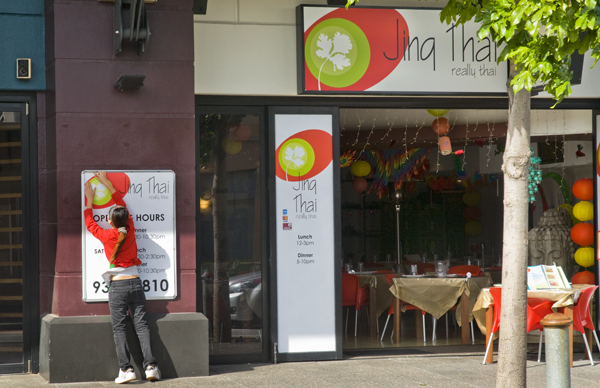 While contemplating all the above I shot this colourful photo of the young woman opening the Jinq Thai restaurant. Also open the new Nonna’s, the former Next Door, with amazing prices. Most main courses are under $ 20.00, while at the former Croissant Express a lovely and classy looking new cafe has just opened. Support them! Comments Off on FREO OPEN FOR BUSINESS! I got this private email COPIED BELOW, so since I have not asked the person for permission I will leave his name out of it. It is in response to my blog articles on the City of Fremantle’s advertising campaign and on counilor Andrew Sullivan’s comments. a) Council passed resolution Wednesday to have officers draft changes to LPS4 allowing ‘discretionary additional height’ (ie no limit specified) on 3 city blocks with much increased height elsewhere. I LIKE TO KNOW WHO SPEAKS THE TRUTH IN FREMANTLE? WHO CAN WE BELIEVE? WHAT ARE THE FACTS? The City of Fremantle, through an open letter from Mayor Brad Pettitt, started a big advertising campaign in the media today with a full page ad in the Fremantle Herald and a half page costly advertisement in the West Australian newspaper. First I was taken aback a bit, but then I thought that with the Fremantle Chamber of Commerce being so negative off the city, it is a good idea to be positive and pro-active about Fremantle’s future changes. In fact I like it so much that I almost would contemplate to stand for and join this active forward looking council. Do I want huge, oversized and ugly inner city development? No, of course not and I’ll fight it all the way. Do I want change for Fremantle that is good? Of course I do! The readers’ outrage in today’s FREMANTLE HERALD about the publication and a photo on the tragic death of a well respected Aboriginal actor in a Fremantle park leaves me wondering if those complaining about it do not set double standards. There seems to be a general consensus that reporting it was wrong because the dead man is Aboriginal. That is racist. Would it have been o.k. to report it had it been the death of a white homeless person? Every day of the week we are bombarded on TV with pictures of atrocities from all over the world. There is a very pixelated photo published of the deranged Norwegian mass murderer standing over bodies. Is that o.k. because it does not show detail? What about all those people who jumped out of the twin towers during 9/11 . We watched it live on our televisions for hours. Should we not report on the bomb blasts that happen too often, killing too many innocent people, or the children dying of starvation in their mothers’ arms in Africa, car crashes, pensioners being bashed at home. What then about the now historic photos of the killings of John F Kennedy, Martin Luther King, Benazir Bhutto, or the starved Jews at the gates of concentration camps? Should we not show the immense tragedies that disgusts us all and we all want to get rid off? Should news organisations only do door stop interviews with politicians, report on media releases, and thus become irrelevant? I don’t believe so. Before migrating to Australia I worked as a press photographer for 13 years for daily newspapers in Germany and also supplied photos to press agencies and magazines. In those years I photographed hundreds of dead and injured bodies from murders, car, helicopter and plane crashes, etc. Did I like doing it? Of course not! Was it tasteful to do so? Of course not! But was it news that needed to be reported on? Absolutely! And I was always aware, and still am when taking photos, that I was recording history. The death of any person is deeply sad and it pains me that another beautiful human being appears to have made the wrong decision and died as a consequence of it. Blaming the newspaper who reported on it is shooting the messenger. Society needs to stamp out drugs and violence, and support disadvantaged people. The media have got a big role to play trying to achieve that. Hey POGUEMODEL. You know who you are, and you are by now aware you have done the wrong thing, because I told you so on this blog, which you read and steal photos from. We all make mistakes and you might not know Australian copyright laws. I won’t be making a big deal out of it if you contact me, but if you don’t, I’ll leave my options open what to do about your copyright breaches. I will find out who you are, so it is best to come forward and admit your mistakes. I am easy to find, so send me an email and we can have a chat. Fremantle Councilor Andrew Sullivan sent me following email and I believe it is fair to show his point of view as well, that is contrary to the one of Councilor John Dowson I posted earlier this week. I am all for robust debate and fairness, so as long as it does not become a slanging match of negativity I am happy to publish opposing viewpoints on this blog, so we, the average punter, can make up our own minds. I appreciate that Andrew took the time to send it to me. The council meeting was already on Wednesday of course! “It is important to understand that what Council is considering this Wednesday is only just the “end of the beginning” of a long process that will involve considerable community consultation. The recommendation before Council is to ask officers to draft a scheme amendment broadly in line with the recommendations that flowed from the work of the City Centre Strategic Sites Working Group that I chaired. At a future meeting, possibly at the August Council meeting, elected members will be asked whether we wish to proceed to advertise for public comment that proposed scheme amendment. If Council proceeds, there will be considerable opportunity for community input into the different proposals that were developed by the community based panel of experts. Following a review of the extensive community consultation process, Council may then elect whether or not to proceed with the amendment. The amendment may be modified at that stage in response to community input, or Council may decide to not proceed with the amendment. The truth is we have to start some where and we charged the community based working group with the responsibility of identifying where that starting point should be. Rest assured that there will be considerable opportunity for community debate and input on the matters that you have raised and many other matters. We are certainly not even close to being in a position to “legislate” for “unlimited” heights as some have put it, although I would strongly dispute that is what the working group have recommended. Indeed, the working group recommended two parallel ways to control or ‘limit’ height. The first is the traditional method of prescribing maximum heights ‘as-of-right’ along with a suite of other landuse and built form requirements. The second set of limitations placed on height is proposed to be contained in a suite of objective performance-based development and design criteria. The use of these performance criteria will only be relevant to a few strategic sites, possibly as few as three. They propose to allow only the most exceptional development proposals. That is they will be very difficult for applicants to achieve unless the development proposed is at the most exceptional level of design quality, building performance and contribution to the public space. If the performance crietria are satisfied, Council would them have the discretion to approve taller buildings. Any decisions makers siting on Design Assessment Panels or the State Administrative Tribunal would be required to have due regard to these planning requirements because that is what the planning scheme will require of them. Establishing performance based planning and design criteria is an equally valid way of controlling development. Indeed, there are many examples around the world where a performance based approach to planning has been shown to deliver better development outcomes. We recently established the highly professional Design Advisory Committee that consists of eminent Fremantle and Perth based architects. They have been asked to assist Council develop the performance criteria needed to provide the rigorous and objective planning framework required to safeguard Fremantle as the special place that it is. They will also be asked to assist Council develop a vision for the precincts known as the “Core” and “Inner East End” which are considered by many as the missing links in what is otherwise a city made up of clearly defined precincts. Importantly, the performance criteria ought to be established prior to Council making any final decision about the scheme amendments that will “legislate” the height controls. Council formed several working groups in 2010 to develop reports in relation to matters raised in the Council’s Stategic Plan 2010-15. The function of the working groups was to bring together community leaders with expertise in specific areas of interest and to assist the Council develop detailed strategies focussed on implementing our Strategic Plan. It is reasonable that Council acknowledge the good work that these groups have done by providing the opportunity for considered community input into the proposals they have recommended. To be fair, their many months of hard work now needs to be put out to the broad community as the next phase of the iterative process of implementing the Council’s Strategic Plan. Unfortunately, there has been a derogatory slanging match being played out in the media between two prominent members of the Strategic Sites working group. I can only say that I am personally disappointed by that. Inappropriate and unhelpful accusations have flowed in both directions and this is frankly the kind of unconstructive behaviour that I thought we had put behind us in Fremantle. I would add to that concern the tendancy for some in our community to be too quick to react negatively, even aggressively, to new ideas before they have been allowed to be properly considered and tested among our piers. Indeed, there is a tendancy to sensationalise matters rather than to constructively debate them and to even make accusations of scandelous behaviour or wrong doing as a way of garnering support for a narrow partisan view. Personally, I would rather we have a robust community debate about what we want for our City instead of having the debate quashed before it has even begun in earnest. Fremantle’s West End was well alive last evening with the grand final of the HIDDEN TREASURES winter music festival, with concerts at the Buffalo and Navy clubs, Merenda art gallery, and the Kucha Pecha slide show event at the Moores building. Yummy curries were on the menu at the Moore&Moore cafe. Out on High Street here was a trio playing in the back of a van, while the retailers kept their doors open despite the inclement weather. Kill Devil Hills‘ concert at Merenda was a total sell out and the Low Key Musicians Club at the Navy Club was packed full as well. No wonder with well known Freo musos Lucky Oceans, Bill Rogers, Jim and Tom Fisher, David Hyam and Dom Mariana, supporting young acts like Billie Rogers, Blue Lucy, Rachel and Heather Climb a Hill, and One Thousand Years. In the crowd I noticed Mayor Brad Pettitt and councilor Andrew Sullivan and many other familiar Freo faces. For me Hidden Treasures rates on the same level as the Cappuccino Strip Street Club and should become a regular event in Fremantle. It must be a great financial boost for the clubs to have so many visitors and it does the struggling West End a world of good to have something so vibrant and positive happening. Well done to all those at the City of Fremantle who organised and supported this! Fremantle is not at all on its last legs, as some around town claim. Bring on more!! 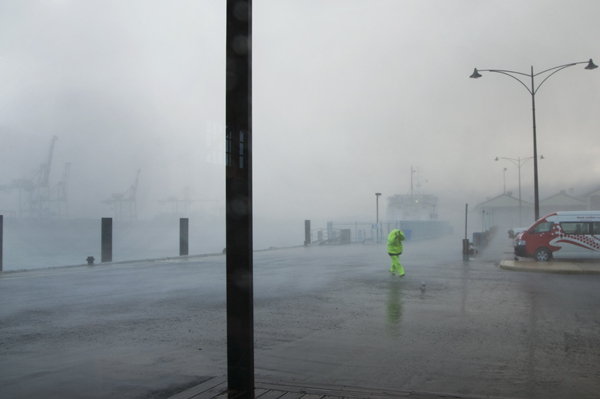 Much needed rain pelted down on Fremantle most of yesterday and this photo taken at B Shed in the morning shows how severe it was at times. One could barely see the cranes at North Quay. Some kind of a strange day and not only because of the stunning wild weather. I love storms and lightning and the rain absolutely pelting down at times! Strange more in the sense of people and things. First this morning there was a camera crew for the City of Fremantle at the B Shed filming for a TV commercial. A strange choice to do it in this kind of weather with swells of 7.5 meter according to the Rottnest Express ferry people. They were going to shoot all over the city, but why with the storm blowing gales, rain coming down in buckets and thunder and lightning returning again and again. I realise camera crews have to be booked well in advance but normally a weather clause in the contract will make it easy to shift the shoot to a better day. Then I was told a ranger as last Thursday’s Hidden Treasures festival wanted the open fires on High Street to be extinguished as there is a law against it. It looks like the Wreck the Fun Police is on the move! An hour later someone from the city turned up out of the blue to remove the artefacts displayed in the Whaler Tunnel at the Round House because the museum wanted them back. No one at the Heritage Guides had been told, so the pieces are still on display. Heard off communication anyone?! And was I mislead to believe council would vote on unlimited highrise in the city last night, when in fact it was always going to public consultation first? Not impressed! News from the Dome site in Fishing Boat Harbour is that there is no new tenant for it. Disappointing!